15mm.co.uk: Age of Might and Steel 2nd Edition now a PDF Book! Age of Might and Steel 2nd Edition now a PDF Book! 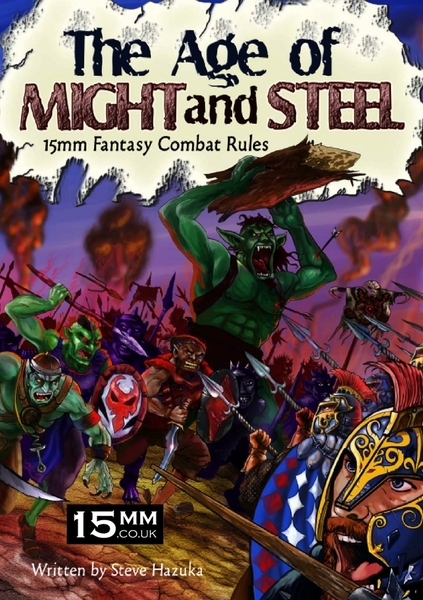 We are no longer supplying the excellent 15mm fantasy battle rules system Age of Might and Steel (AoMaS) as a printed book as the print run is now finished and we have other plans for this genre in 2016. But do not despair! This excellent and simple generic wargame rule book is now on our website and our blog as a 5.00USD download! Have you ever wanted to field large fantasy armies with many blocks of infantry and cavalry with lots of monsters, artillery, heroes and magicians that looks great on the gaming table? Have you been put off by ever more complex rules and the need to spend many hours playing to get to the glory and thrill of victory? Then The Age of Might and Steel is the rules set for you! Play a full game inside an hour with 100-200 15mm Miniatures on the table. All the action played out using 1 six sided dice (1D6). Armies built from Units made up of Stands of several miniatures. Add Generals, Monsters, Magic Users, Heroes and more to your Units. BIG Fantasy Armies easily controlled ! The look of a complex battle without the headaches. Create original scenarios or use the included Points System and Army Lists. Combine Armies into Nations for even bigger games! For busy gamers who enjoy a rewardingly simple game that encourages tactics. This book contains all the rules you need to play, sheets of counters, army lists and also the "Elden of Groy" four scenario linked campaign to get you started. This Book is sold as a 5.00USD download PDF file by our online partners Oronjo. To make a purchase select the title you want from those on this page and then click 'Buy' where you see the blue icon. This will take you to the Oronjo payment gateway that links to Paypal. You can visit the page and use the blue icon to purchase the download on our website HERE. There are full content details of the book on that page. We have other downloads for purchase on a page of our blog which you can visit HERE. The entire range of USEME titles!